** Please refer Kokuu, Shokou. ‘Golden Week (Japan)W’, when there are several National Holidays in a week or so, started yesterday in Japan. According to how the weekend day-offs combine to the National Holidays and those who can take their paid vacation during this period, many would be having over 10-days-holiday on this very week. No wonder the week is called ‘Golden’, especially in the time when people had to work half-a-day even on Saturdays. With the nice sunny weather of the season, the special holiday week drive the Japanese out of their house, off to enjoy their free time apart from those who hate the crowd which include us…. If you are like us, it may be better for you to visit Japan before or after this Golden Week. Still, to those who don’t mind the crowd, there are several special events and festivals taking place in many sightseeing places which is, in fact, rather, a good time for your visit. Below is the list of National Holidays on Golden Week for your information when visiting Japan. Ploughing and putting water in the rice field. Preparation done before planting the young rice plants. Photo from ‘Tadamaki Farm, a farm in Hyogo prefecture specialised in natural poultry farming and duck agricultural method rice farming. Like the name given to this special holiday week in Japan, the season at this time of the year now announces that there will be no frost from now onward. Like the plain around Tokyo, frosts were last seen more than a month ago but on the highlands or small plains between high mountains, you could be expecting frosts even if the daytime temperature rises to certain degrees according to the radiative cooling at night. But from now onward, the chill at night eases throughout Japan when those who engage in farming would start to plant those weak to frosts. Looking at the season phrase, the first Japanese ‘Shimo’ is a noun for the frost, followed by the verb ‘yande’, meaning to stop. Therefore, the first part of the phrase tells us that the frosts stop. The next word ‘nae’ is a Japanese for ‘young plant’ as a whole but here, the young plant is specialized in rice plant as Koyomi has a side of farming calendar and rice was the most important plant for the farmers. Finally, the last word ‘izuru’ is a verb pointing out the action of the young rice plant which is about to sprout. So, the whole meaning of the phrase would be; frosts stop and rice plants start to sprout. 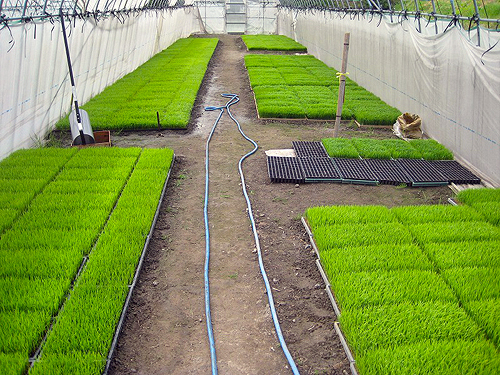 Beds of rice seedlings sowed in the hot house, ready to be planted in the rice felids. Photo from ‘62-sai karano shuno, Tsuredure naru mama ni‘. 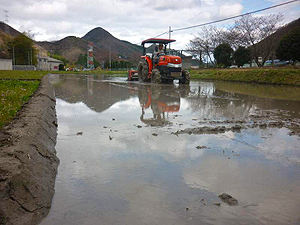 To many Japanese, this time of the year should be the happy holiday week but to those who are engaged in rice farming may be one of the most busiest time of the year as they have to plant the young rice plants in the watered rice fields. We know that one of our friends who work in Tokyo would have to go back to his parents’ house to plant the rice plant instead of his old parents during his Golden Week holiday. If you visit Japan at this time of the year, you may see fields with water shinning like mirrors from the windows of the aeroplane when you reach near the ground. Some may be already planted but some still are like shallow ponds but they are for planting the rice. ‘[WKusa mochi]’ literally means grass mochiW, the rice cake but this grass points out mugwortW(Japanese mugwort to be precise) which has been a grass that grows in wild, picked by the Japanese as a spring vegetable plant and a herb. 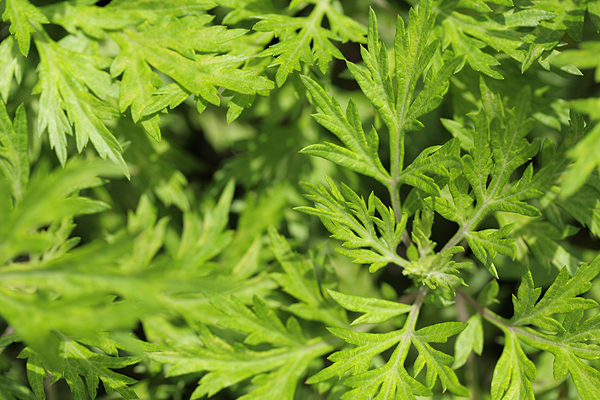 Fresh green ‘Yomogi (mugwort)’ leaves which has been a folk medicine, food vegetable and ingredient of Kusa mochi. It is said to be rich in eucalyptolW, camphorW, oleic acidW, linoleic acidW, vitamin A, vitamin B1 and vitamin B2 which has been processed in a herbal medicine to stop bleeding or dried young leaves infused like tea for stomach pain, diarrhoea, anaemia and a sensitivity to the cold. Woman putting up with the heat of classical Kyu. Looks hot!! Drawn by Honen Tsukioka. The grown dried leaves could be used as bath additives, effective on lumbago and very effective on haemorrhoids. The fluff taken from back of the grown dried leaves is called ‘Mogusa (MoxaW) / もぐさ’ which is used as the small fuel and point of stimulation in ‘Kyu (MoxibustionW) / 灸’, a treatment stimulating the acupuncture pointW by burning very small amount of Mogusa heaps. 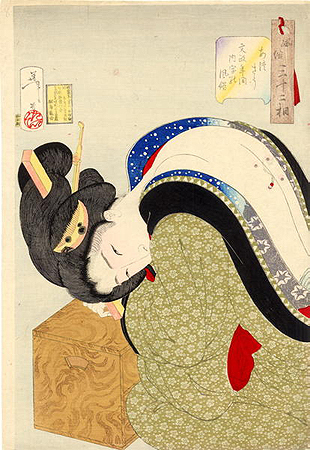 The treatment was popular among the Japanese, especially to those who were engaged in physical labour. This included people as housewives who was suffering from stiff back and shoulder by their hard housework without useful electric devices that we all have in our homes now. This treatment works well though it leaves slight burnt marks if you were to repeat the treatment over and over again which isn’t a nice thing for women, gradually became a treatment for the old and disappeared from the modern families until an easy, non-burnt marking Kyu, “SennenQ’ was invented by Senefa Corporation. There remains an old phrase ‘to scold’ children as ‘Kyu-wo sueru / 灸を据える – to set Kyu’ describing that setting Kyu can be a punishment for children who cannot stand the heat of the Kyu on their skin. By this phrase, you could see that setting a Kyu was a medical treatment done daily at home by housewives in the old days. One of the Kyu which can be used without lighting. Photo from SennenQ Official Site. 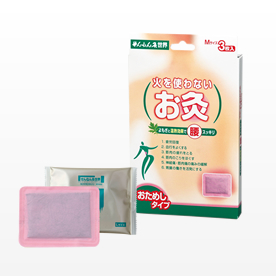 The Kyu products which refrain from getting burnt marks with much lighter stimulation, sold in drug stores as ‘SennenQ’, are pretty popular among working women who don’t want to rely too much on chemical drugs nowadays. We have tried this ‘SennenQ’ several times before when we were suffering from strong stiff shoulder which worked well though we needed guts in the first place to light the small Mogusa patches. 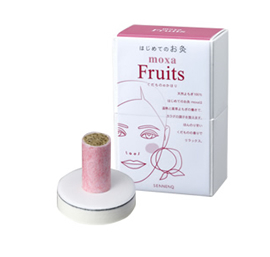 The smell of the smoke is strange though it’s not that hard to getting used to it and the pain from the lightened heat is bearable if you chose the right Mogusa patch (they are sold in several levels according to the heat amount). There are Kyus which you don’t have to light or with smokes scented like the incense smelling even fruits now! Don’t worry about the burnt marks. If you use the right one, no burnt marks will remain. If you are interested in having this treatment, why not visit ‘SennenQ Ginza Showroom‘? The shop would consult you your best Kyu, moreover, you could give a little try to this awesome treatment of old Japan. If you like it, Kyu could be a nice souvenir for you to take back home. This REALLY works! ‘SennenQ’ with fruit scent. Photo from SennenQ Official Site. Going back to the general Yomogi subject, you can find ‘Yomogi’ growing almost anywhere in Japan, even in the flower beds in between the big streets in the centre of Tokyo but of course, it would be better for you to pick them out in the countryside where there are no pollutions by car fumes. You may have a chance to see people picking young Yomogi leaves for their ‘Ohitashi (boiled, seasoned with soy sauce and other toppings as Katsuobushi)’, ingredient of misoW soup, tempuraW and Kusa mochi at this time of the year. Typical Kusa mochi. Photo from Sasaki Seika Official Site, a Japanese confectionery in Mie prefecture. Kusa mochi / 草もち is a steamed-chopped Yomogi kneaded rice cake filled with anko (the sweet ban pasteW which its’ record remains in the book of Nihon Montoku Tennō JitsurokuW, a history written of Emperor Montoku in 9th century. 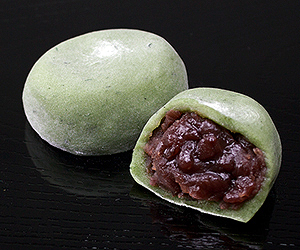 Kusa mochi was then made with Yomogi or Jersey cudweedW kneaded into rice cakes until mid Edo periodW which only the Yomogi version still remains today. Kusa mochi is also called Yomogi mochi which could be bought in almost any Japanese confectioneries all over Japan at this time of the year. 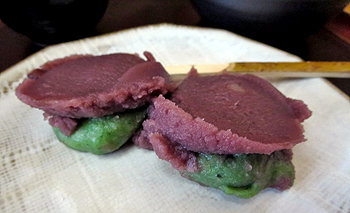 ‘Chujo mochi’ named after Princess Chujo, another version of Kusa mochi with anko pasted outside mochi. Photo from Chujo-do Official Site, a Japanese confectionery near Taima-dera. There are still many, especially in the country side, who make their own Kusa mochi at home with their returning family member on the Golden Week holiday. A seasonal Japanese sweets with fresh green eucalypti scent with slight bitterness that matches the sweet anko inside which you could taste while you visit Japan at this time of the year.